Many new PCs come with a 1 month trial of Norton or McAfee – but when that trial is up you’ll have to pay a subscription. Much more economical is to use the built-in antivirus called Windows Defender. Its free and it doesn’t complicate your life with issues over the firewall and bits of bling. Its also more effective than some of the paid for products, but its turned off by default. Here’s how to turn it on. 1. Make sure you have removed all other antivirus by going to Control Panel > “Programs and Features” and removing any other security software. 2. 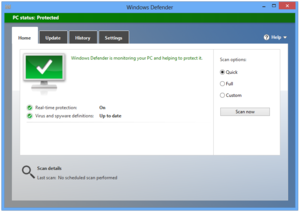 Now search for “Windows Defender” and click on it when it appears. 3. If its turned on you’ll get a window, in green, saying you are protected. If its turned off you’ll get all scary red massages, that’s fine just go to “Settings” and turn on “Real-time protection”. This entry was posted in Security, Uncategorized, Windows 8 and tagged PC, Security, Windows 8. Bookmark the permalink.